Be a part of raising awareness and support the Asperger's community with our Personalized Asperger's Awareness Key Chain. This wonderful design features bright colors for joy and optimism and the puzzle pieces illustrate the complexity of this condition that has changed the lives of so many families. Show your support in every way possible each time you attache this Awareness Key Chain Keepsake to your keys. 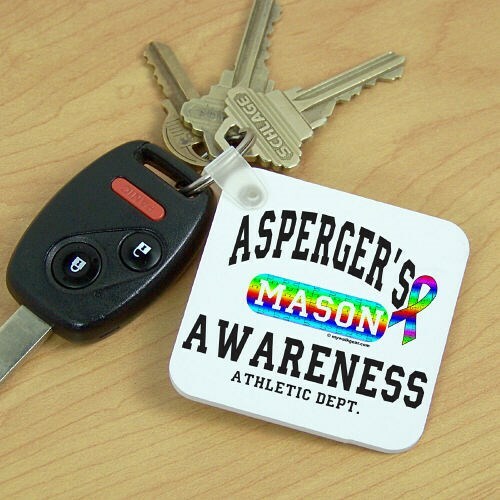 Our Asperger's Awareness Key Chain is perfect for spreading awareness. This Awareness Key Chain measures 2 1/4" x 2 1/4" and is 1/8" thick. Your Key Chain is made of fiber glass reinforced plastic and includes a key ring. Free personalization of any name is included. I have had wonderful service, products were great and would not shop anywhere else. My grandchild has Aspergers and found this website to be what I have been looking for. Additional Info Wearing Personalized Autism & Asperger's Awareness Apparel, you are promoting acceptance and understanding of this awareness. Awareness Apparel is great for showing your support during awareness walks and raises awareness to those around you. You may also enjoy outfitting your entire Autism & Asperger's Walk Team with our Personalized Asperger's Support Hooded Sweatshirt and our Personalized Asperger's Long Sleeve Shirt.